This is a dish that I grew up with and that I love. My father grew up in a small town in Texas near the border closest to Louisiana so he was influenced by Cajun cooking. Not to mention we spent most of my growing up years living in both Louisiana and Texas so dirty rice and gumbo were commonly seen on our kitchen table. There are several different ways to make dirty rice. Everyone seems to have their own special recipe. You could use ground beef or sausage, but I chose to use Jimmy Dean turkey sausage so that I could have this as a side dish and still have part of a lean left over. Plus I think the sausage has more flavor. It is also common to use chicken livers and gizzards when making this, which would sweat into the white rice and cause it to turn brown, hence the name dirty rice :) I do not like liver or gizzards so you won't find any in my dirty rice. Because we can't have rice on the Medifast plan, I decided to use grated cauliflower in place of it and it worked really well. Honestly, you really won't miss the rice. Delicious! Enjoy! 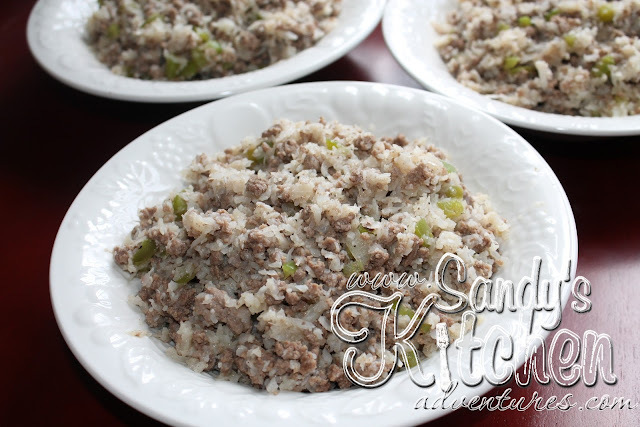 In a large skillet, add ground beef, green peppers, celery, onion, garlic powder, creole seasoning and black pepper. Cook over medium heat until ground beef is no longer pink and vegetables are tender. Drain any excess liquid. Stir in chicken broth, cauliflower, and sausage. Turn down the heat to low and let simmer for 5 min. Enjoy!